34 Restyling & tRuck AccessoRies | April 2015 restylingmag.com more price-conscious shoppers. "We are now reaching out and doing new things," he says. "We did mailers to those in the community. We also built a show Jeep to take to the Brush Run in Crandon, Wis., then, we took it to some car dealerships in the area. We're bringing it to the New Motorama motorports show in Green Bay, too. "We also have a great IT department working on a new website, which I can't wait to see because it will show all the products we have." The Green Bay Toys For Trucks store spans 6,000 square feet. About 2,000 square feet is used for the retail showroom. Ciuplinski has redone the red, black and chrome showroom area eight or nine times and divided it into departments since taking over the store. "We want the customer to be drawn to the showroom like a mosquito to warm blood," Ciuplinski says. "We try to make things pop and shoot for a flashy and appealing look. The chrome rims really stand out on display here, although the latest trends in that industry also favor black and green powder coats." PoPular Products Speaking of wheels, Ciuplinski says the new PVD chrome wheels are very popular in Wisconsin because specialized finish "does a much better job resisting road salt than other chrome finishes." One of the more popular departments is lighting, Ciu- plinsky says. The Vision X brand does particular well. "I love that product's lifetime, no-questions-asked war- ranty," he says. "The quality is great. We have been doing Vision X for about two years now and I have not had one repair. Other vendors will also stand behind their products, but if a knockoff fails in two or three months, we still have to deal with the labor involved in removing it, sending it back and re-installing a replacement unit." In the tonneau cover department, Ciuplinski says every customer has different tastes in design and desires different features. In response, he displays as many different covers as he can. 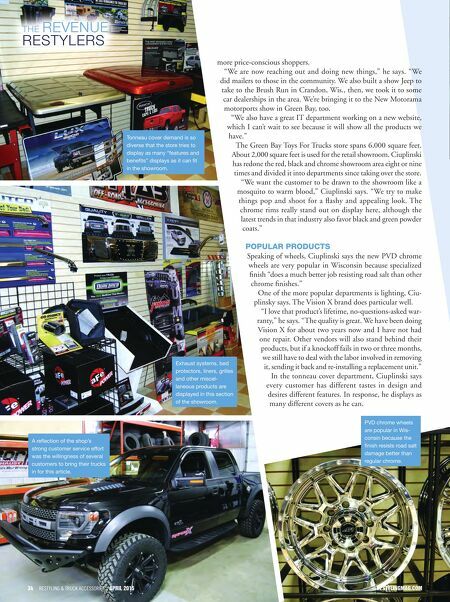 34 Restyling & tRuck AccessoRies | April 2015 restylingmAg.com The Revenue ResTyleRs Tonneau cover demand is so diverse that the store tries to display as many "features and benefits" displays as it can fit in the showroom. 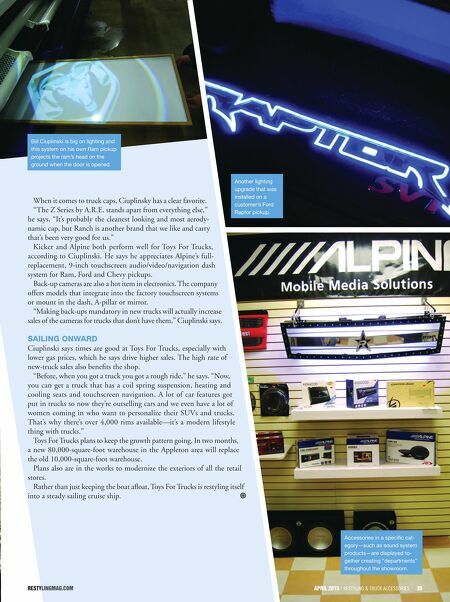 A reflection of the shop's strong customer service effort was the willingness of several customers to bring their trucks in for this article. Exhaust systems, bed protectors, liners, grilles and other miscel- laneous products are displayed in this section of the showroom. PVD chrome wheels are popular in Wis- consin because the finish resists road salt damage better than regular chrome.